The Regent Luxury Suites is a 3-Star hotel situated at No 25 Joel Ogunnaike Street Ikeja, GRA, Lagos Mainland. It is located in an upbeat part of Lagos and is only 3km from the Murtala Mohammed International Airport. The building is an architectural masterpiece and has an array of exquisitely designed suites which come with excellent gadgets to make every guest's stay a memorable one. The Suites come in the Standard, Standard Double, Deluxe and the Presidential categories. 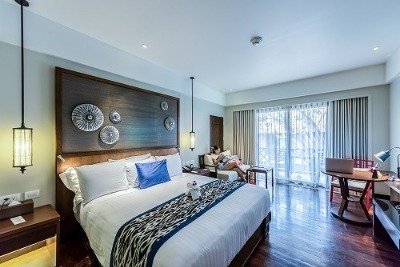 Each suite has air conditioning, double bed, excellent shower facilities, free internet access, and a flat-screen television with local and international channels. Guests also get free toiletries, a kettle, and slippers in all the suites. The Regent Luxury Suites also offers a wide range of excellent hospitality services which include: a restaurant, swimming pool, free parking space, fitness facilities, uninterrupted electricity supply, reliable security, and 24 hours front desk. Other special services available to guests include: concierge service, currency exchange, room service, car rental service, shops within the hotel premises for guests to conveniently purchase whatever they might need. Q: Does The Regent Luxury Suites offer taxi shuttle services? A: No, the hotel doesn't offer such services. Q: Does Regent Luxury Suites have a fitness center? A: There is a fitness center available. Q: Does The Regent Luxury Suites have a swimming pool? A: A swimming pool is available at the Regent Luxury Suites. Q: Does Regent Luxury Suites offer guests any extra services? A: Guests get to enjoy a variety of special services like currency exchange and car hire services. Q: Does The Regent Luxury Suites have adequate parking space? A: The Regent Luxury Suites has a large parking space for guests to use. The Regent Luxury Suites is a top-class hotel in Ikeja, Lagos. Awesome is the word that could capture my visit to this hotel. I am so impressed by your services even though you must not relent. Nice taste for outstanding facilities. The hotel is nice and beautiful. well equipped and secured environment, good quality services and well behaved staffs. The only thing is that the refrigerator in my room was faulty. Next time I’m in Lagos I would definitely come back because of the warm treatment I got from the entire staff. I had no cause to complain of anything. Have nice pictures of The Regent Luxury Suites?